I was an art major in college, and part of our curriculum was to take a couple of studio drawing classes. This Indian ink drawing was a piece I completed for one of those courses. Back in college, still life always seemed to be a bowl of the same plastic fruit that had been in the art department for years. Occasionally other objects were thrown in, although usually I was pretty bored with the subjects we tackled. For this piece, I thought it was pretty unique that we drew from a block arrangement. Using Indian ink made the composition even more interesting, since we had to focus closely on the variations in contrast for the highlights and shadows. 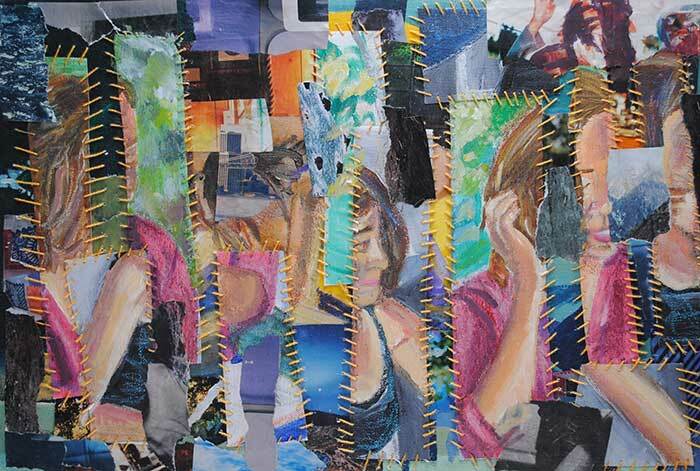 Back when I was in college, I worked on collages made from magazine strips in my free time. I was studying painting at the time, but I still tried to make time for collage. 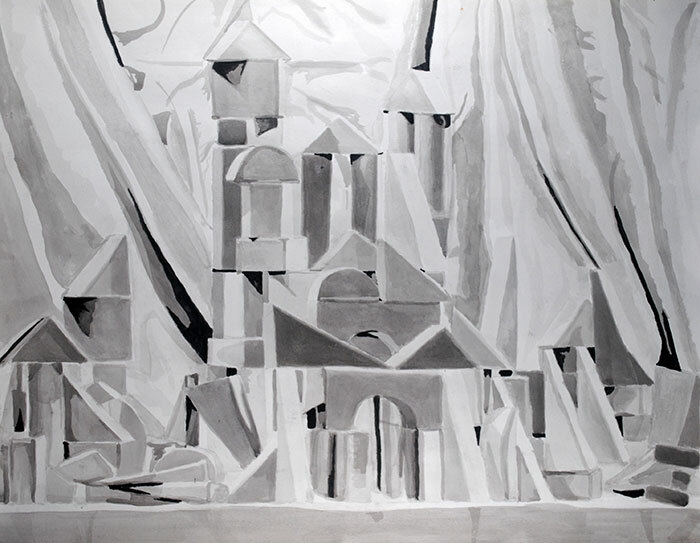 I also often tried to work in collage with my paintings, and this piece is an excellent example of just that. To make this piece, I used two different canvases. One of them was stretched, while the other wasn’t. I created two paintings on both canvases, and then cut up the canvas that wasn’t stretched and stitched the pieces of the painting onto the stretched canvas. Thus I created a collage of two paintings. 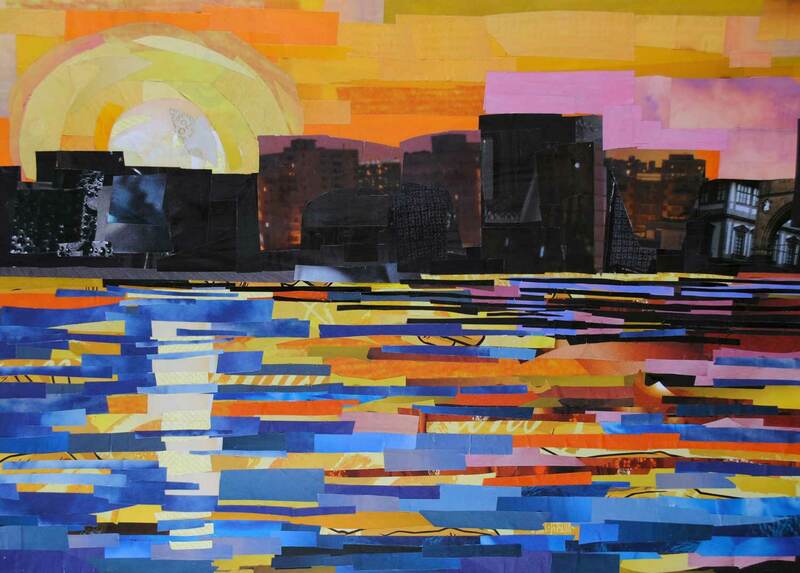 The piece was made with acrylic paint, some magazine strips that were adhered to the canvas, and thread. Back in college, I kept a sketchbook for one of my painting classes. My professor was adamant that we worked in our sketchbooks on a weekly basis (at least). As a result, I sometimes added quick doodles when I wanted to get these sketches “out of the way.” Sometimes I surprised myself with how my quick drawings turned out. Perhaps I should take up sketching again? I think it’s a pretty great way to brainstorm creative ideas. 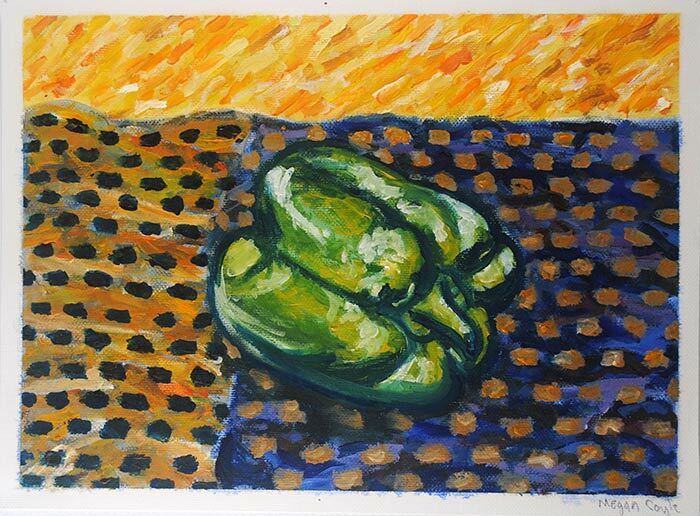 This is one of the paintings I completed during my freshman year of college. I decided to make a slightly abstract piece, and started off with an acrylic painting, then drew on top of it with oil pastel. 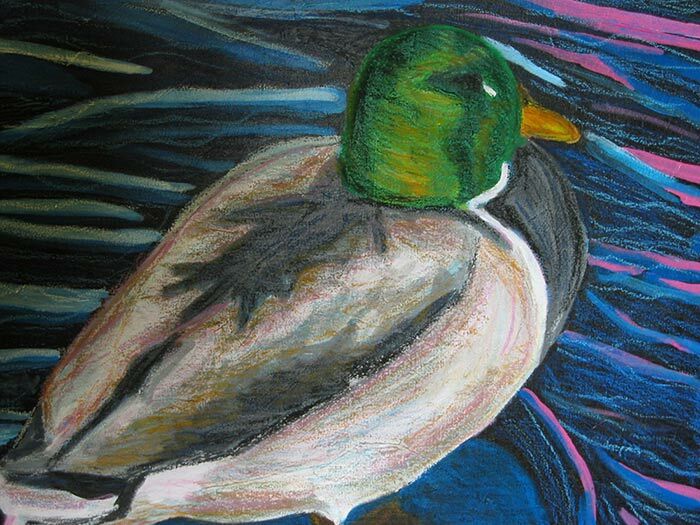 I was always drawn to using oil pastels back then. I think there’s just something about the way drawn markings look that I always enjoyed incorporating them into my artwork. 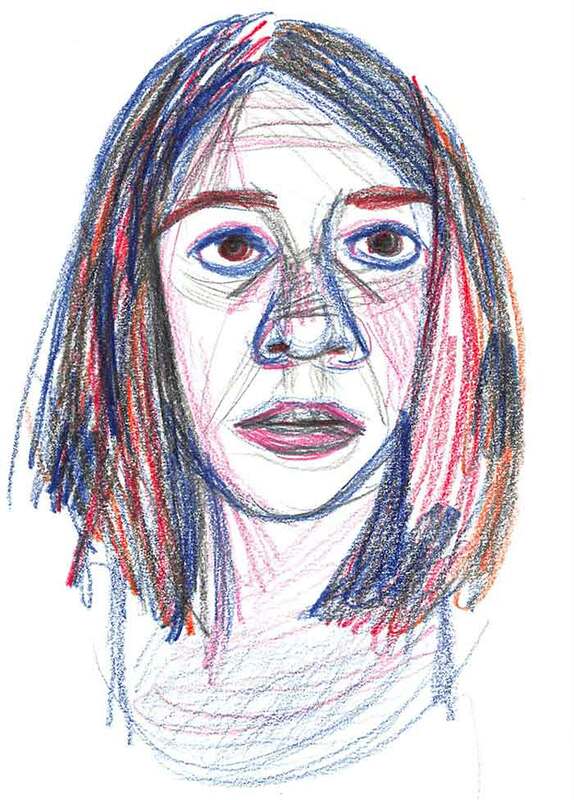 I was looking through a few old sketches I made back in college, and came across this self portrait. It made me realize that over the past few years, I’ve had a tendency to focus a little too much on collage. I think I’d really enjoy revisiting some of these other mediums that I used to work in. Perhaps I should start a new color pencil sketch series? We shall see…if anything, it’s been great getting inspired by artwork from my past. I’m looking forward to changing things up again in the future. I made this textured oil painting back when I was a junior in college. 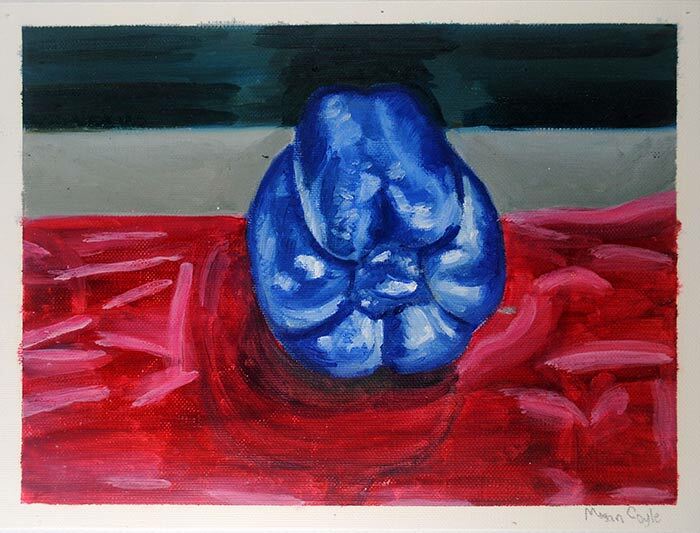 This was part of my studio work as a painting major, and I was trying to tackle a still life and make it interesting for myself. 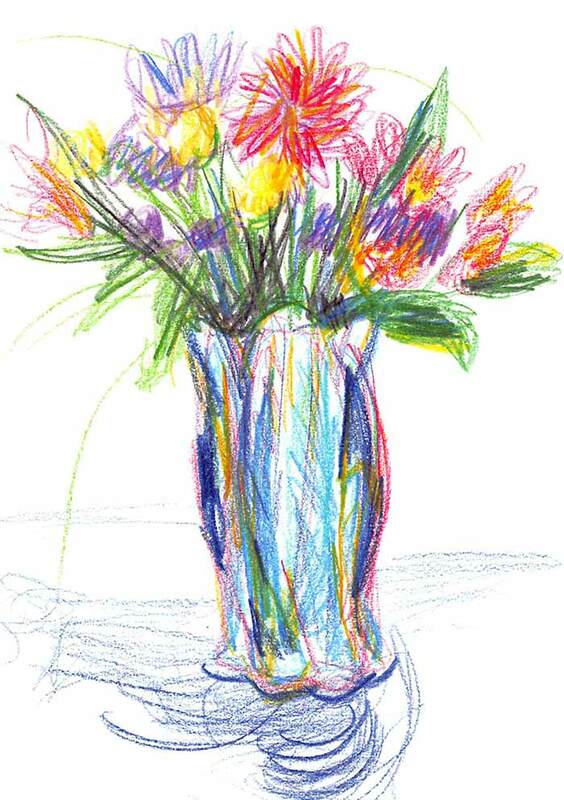 I remember I used to try to avoid making still life works of art because I didn’t think they were very exciting. These days I’m more interested in tackling still life when it involves food of some sort. I used my palette knife for the vast majority of this painting. 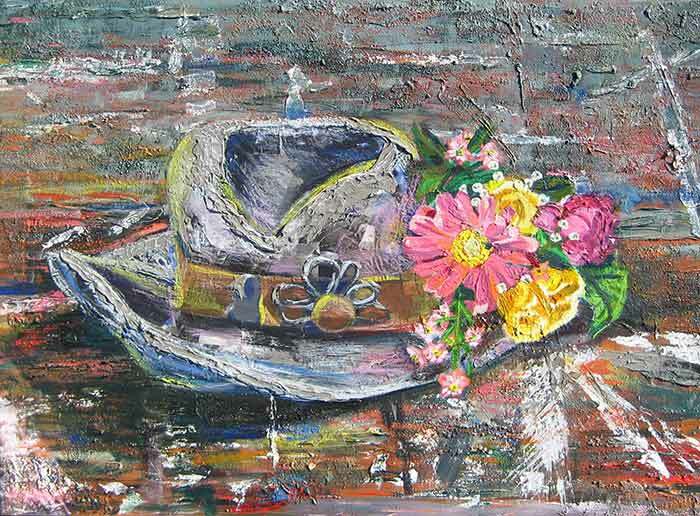 You can see a lot of texture in the background, and I actually layered quite a few layers of paint for sections of the hat as well. This photo collage was one of my art projects back when I was in college. We had to pick a shape and then take pictures of objects that contained that shape. It was an interesting exercise that got you thinking more about the shapes that make up objects around us. 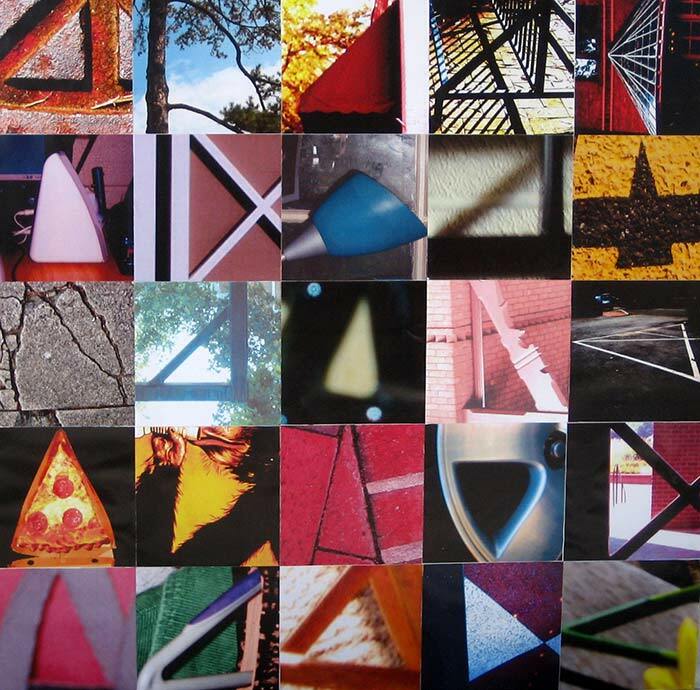 I decided to pick triangles and after I took a series of pictures, I cropped them, printed them out in our computer lab, and rearranged the photos on a square piece of paper. Overall, I enjoyed finding shapes in unexpected places. And I also liked the process of arranging the cropped images – finding a good balance of color and the variation of the similar shapes. Before I started focusing extensively on making collage art, I was a painter. 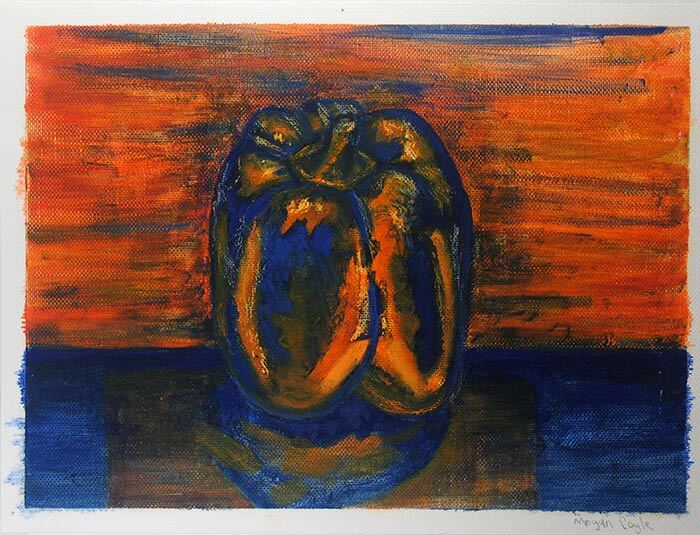 I studied painting back in college, and during my freshman year, I had an assignment to create a still life series that used a different technique for each painting. 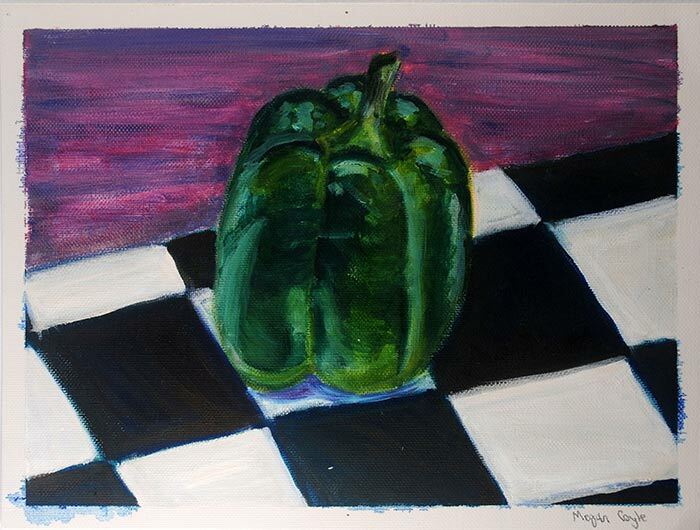 I decided to make a series of bell peppers, and my first painting (pictured above), was meant to mimic the style of Vincent van Gogh. My next painting focused on only using the complimentary colors orange and blue. The next piece in the series used arbitrary color. Blue is actually one of my favorite colors, so it was only fitting that I used blue for this particular piece. And lastly, I made a painting using more natural colors. I decided to make the piece look flatter so I could simplify the overall composition even more. 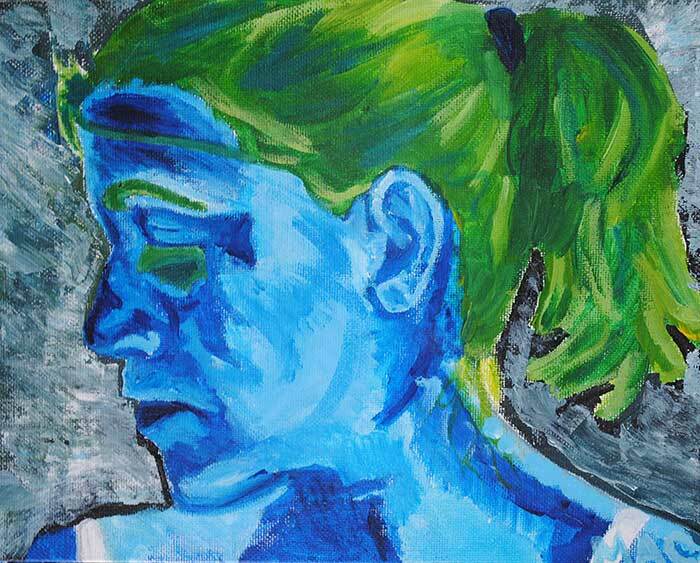 Before I was immersed in studying painting in college, I made quite a few acrylic paintings in high school. This piece was part of a series I made where I played around with using color to convey different moods. As you can see here, I used cool colors to convey a somber tone. I also painted the background a dark color that I lightened up a bit by painting a thin layer of white paint over it. 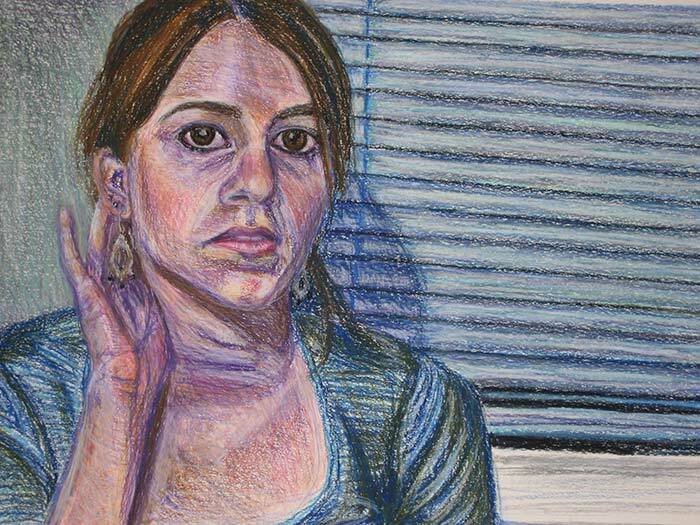 I made this oil pastel self portrait drawing during my sophomore year of college. At that time, I was taking quite a few studio art classes. It’s also around the time I decided that I was going to pick up art as a double major, instead of just minoring in it. I really enjoyed working on the face and eyes for this piece, although the hand was a bit of a struggle. I thought it was fitting to share a piece from my past, to illustrate how much your work can change and develop over time. Your work won’t always be “perfect” or turn out the way you’d like it to, but each new work of art you make will help you grow a little more as an artist.